Here we go. Erik Guay on the course. This doesn't look good, he was too careful in the middle of the course. Mayer from Austria still holds the lead. @KatePettersen_ @CBCOlympics @erikguay still proud of his accomplishments! That was really disappointing. The Olympic Games are never easy, win or lose. 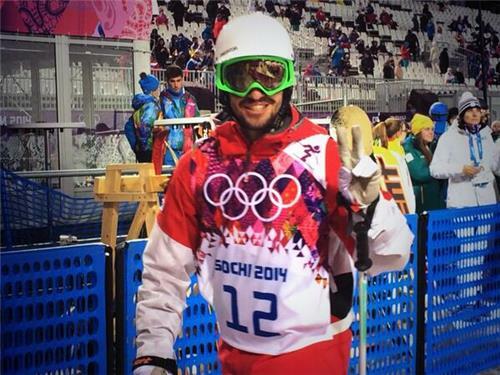 One more chance for a medal for Canada on men's downhill at #Sochi2014 with Manny Osborne-Paradis coming up. Canada's last hope here is Manuel Osborne-Paradis. An extreme long shot. A top 10 finish would be good for him. Hey @Callum any thoughts on how Manny might do? @Mark: I spoke to him earlier this week. He's healthy, and said that he likes the course. And...he's a gamer, a race horse...so anything is possible. But anything is always possible, that's the beauty of the Olympic Games! Defago from Sweden on the course now, Osborne-Paradis up next! Here we go, Osborne-Paradis on the course! Not today, for any Canadian. Not the day the Canadian Cowboys were hoping for. Downhill is such a crazy sport, it's fast and it's unpredictable. These guys are heroes for even doing it. Not Canada's day. Thanks for following along with our coverage of the Sochi 2014 men's downhill. Less than 20 mins to go until the Mens Moguls competition gets underway. The field includes Alex Bilodeau, Mikaël Kingsbury, Philippe Marquis, and Marc-Antoine Gagnon. Keep it here for up-to-the-minute results. The countdown is on! Here's a little vid to get you excited!